Congrats on the wonderful news! A sweet little girl! Big congrats on your baby girl! What a perfect treat to celebrate! Congrats on having a girl. That didn't happen at our house! I made those Martha Raspberry cookies once last year. Yummy and pretty. Yay! Wonderful that you're expecting a girl! These cookies are very cute and sound delicious. I love dark chocolate anything, but as a front door it's very dramatic. I'm also looking forward to the apple tarts. What adorable cookies...and congratulations on the great girl news! You will get a lot of "How perfect - one of each!" comments, and after only 8 weeks experience of having one of each, I can tell you it's pretty great. Congratulations on having a girl! These cookies look great! I am so in love with sandwich cookies-I have to try these! Congratulations on your baby daughter AND your pretty in pink cookies. Congrats!! You must be so excited. These pink cookies are quite fitting. congrats on your baby girl in-the-making! :) How wonderful for you all!! Cookies look sooo great!! Must be a 'think pink' week! congratulations!!!! That's so fun! The cookies looks so yummy too! Yahoo!! Congratulations on that beautiful, gorgeous, and healthy little girl you have there!! Such wonderful news for you and your family! Can I vote for the name: Meghan? Congrats! When are you due? After 2 girls, we're having a boy in a couple months. Girls are so fun, you'll love it! The cookies look great, the sous chefs love sandwich cookies. I'll have to give these a try! What a wonderful post and delightful cookies. Congratulations on your wonderful news! Congratulaitons! The cookies look great and I hope the cake turned out well. I look forward to seeing it posted at the end of the month. i am very excited about the girl too! food looks great, i hate looking on here because it only makes me want to taste!! Congratulations on your baby girl news! 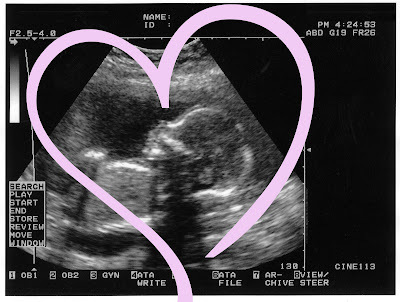 The ultrasound is just beautiful! Congratulations!! And your cookies are too cute! Congratulations! What a great way to celebrate. The cookies look so good. Awww! A sweet little girl to enter your world. Congratulations! Your pink sandwich cookies are perfect for a baby shower. You're so cute! Congratulations on a little girl! I just had a boy (my first) as I hoped, but now I am worried I will have all boys and not a girl! It is so fun! I can't wait to check back on you! Perfect cookies for your perfect news. Congratulations! congrats on your having a girl! The cookies look fantastic! Sooo yummy! Wonderful news too! How exciting! Loved the Caillou comment--both my girls are big fans. And the cookies look great--I love raspberry anything. These are beautiful cookies and I'm sure they taste wonderful. Annie im so happy for you its a baby girl..
Best wishes for your baby girl! The pink cookies are just adorable. I have a friend who is due in July. If it turns out to be a girl, I will definately surprise her with a batch of these goodies! Congratulations Anne i pray it would be a healthy baby soon to come..
a new baby blessing is here... congrats.. I wonder if these would be purple if I used blackberries from my garden. . .